If you’re looking for the optimal umbrella stroller for travel you probably own another device that is just not suitable to this purpose. In most cases it’s the weight and dimensions after folding that makes it difficult to use the primary stroller while travelling. That is also the reason that many parents decide to buy a second model that lightweight and compact. It does not necessarily have to come with all the bells and whistles as the first one but has to be easy to carry, fold and use. 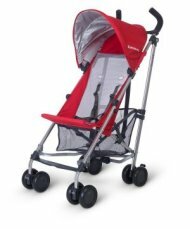 Below is a list of most popular umbrella strollers that meet these criteria. 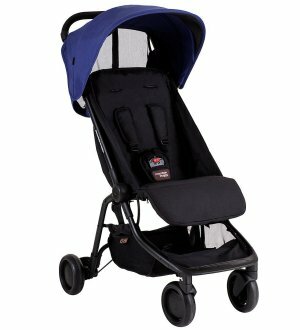 See also to bottom of the page to learn more about the important features of strollers suitable for travel. High weight limit (50 lbs). This stroller really folds to a size of a small bag! With it’s great maneuverability, ultra compact size once folded and lightweight, the Nano is the optimal choice for families travelling with a baby. It has exactly what you could expect of a travel stroller and its quality of finish makes it easy to use for parents and comfortable for the little passenger. Nano fits in an overhead compartment of an airplane. Some parents find this feature to be a lifesaver as they can place the baby in the stroller immediately after disembarking the aircraft. This often mean less fuss and less bags/items lost while you try to get the whole family off the plane. Front wheels can be locked straight. On flat surfaces the swivel front wheels makes Nano maneuver with ease. On the other hand while you are on grass, dirt road or any other uneven surface the ability to lock straight the front wheels is priceless. Puncture proof single wheels. A flat tire in your stroller could ruin even the most meticulously planned trip and turn it into a tiresome, lengthy and unpleasant ordeal. With Nano it’s just not an option as the wheels are puncture proof. This buggy comes with single wheels which makes it much easier to run over more challenging surfaces. Accommodates a baby car seat with no additional equipment. There are special safety straps included which enable to secure the seat. The fitting takes only a moment, see details in the video review below. Shoulder strap. After you fold it you can carry Nano on your shoulder like a bag leaving you with both hands free. Generous basket underneath the seat. Safety harness with two stage release. Toddlers learn quickly by observing and copying what their parents do. Once they spot that you manipulates with the buckle of the safety harness they will undoubtedly try it themselves. If you keep pressing on a safety buckle of a car seat or a stroller in various places eventually it opens. You can be almost sure that your baby would try to play with such an extraordinarily interesting thing as a buckle of your stroller. Normally this pose a risk of opening the harness but not in Nano. The specially designed buckle requires coordinated two step approach which is clear and easy to use for an adult but incomprehensible for a toddler. Wrist strap. A special strap that goes around your wrist and prevent the stroller from tipping over and provides additional safety while you go downhill on a slope. Reclined seat. A very useful feature that enables comfortable napping. Adjustable footrest. A rare feature in most lightweight strollers but can help younger passengers to catch a nap. Single-piece handlebar. Makes operating the stroller on a flat surface much easier. Adjustable shoulder straps (both length and position). Comes with a Travel Satchel. Handy to protect and keep the stroller clean while travelling. Easy to pack even into very small car trunk. plethora of features (reclined seat, adjustable footrest, can accommodate a baby car seat). No rain cover is included (available separately). Looks very alike Summer Infant 3D lite. It’s slightly lighter (11 lbs) and easier to fold as only one hand (foot actually) is needed to fold it. There is also a carry strap and 5 point safety harness. There are also some differences (more or less important). 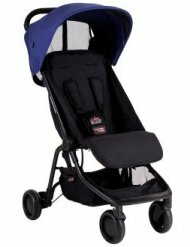 This stroller can accommodate babies up to 37 lbs (in 3D the limit is 50), has much smaller recline angle (does not go as flat as 3D) and has no pocket for extra storage and no cup holder. The canopy in this model does not extend, so if extra protection against the sun is needed you will have to use a piece fabric. Chicco Capri does not however recline as much as the 3D model. Summer Infant 3D lite is an affordable yet reliable and well thought out stroller. The number of features that it comes with may seem unproportionally high to its price which is really surprisingly low. The stroller offers 3 position recline making it suitable even for the younger babies. With an almost flat recline its perfect for an afternoon nap. For the comfort and safety of your baby there is a 5 point safety harness with padded straps. It’s easy to unlock the harness with a single press of the button on its front. To prevent your baby from accidentally pressing the release button there is a special cover that hides the buckle from baby’s sight. The front wheels of Infant 3D can be locked straight for better maneuverability on uneven surfaces. For situations when you have to carry the stroller a handy carry strap (included) makes doing so more comfortable. Infant 3D lite comes with a decent size basket than can accommodate a diaper bag or even a bag with groceries. It’s easily accessible when the seat is in upright position. There is also a zipped storage pocket at the back of the seat. This can be used for keeping keys, wallets or phones. Additionally on the side of the stroller is a cup holder which makes bottles more accessible and provide additional storage space. The wheels are made of plastic which makes them rather noisy. If you often travel across a city with your baby this stroller can make your life much easier. The unique, patented frame makes it so easy to fold that you can do it with one hand… while holding your baby in the other. Getting on and off buses, subway or trams can finally become painless. 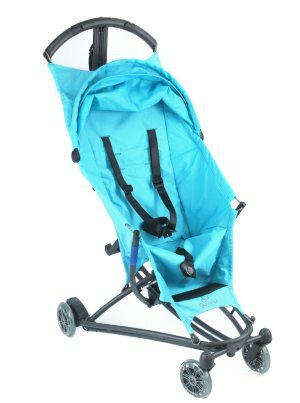 After being folded this lightweight stroller can be carried hands-free on your shoulder thanks to a carry strap provided. Quinny Yezz is not as versatile as full size (often heavy) devices but rather come with the bare minimum to get you and your child from point A to point B safely and reasonably comfortably. A worth mentioning feature that makes Yezz a great umbrella stroller for travel are its wheels. The high quality rubber as well as special bearings makes it surprisingly easy to push the device even with a heavy toddler inside. Those wheels in connection with its unique frame enable flawless turning even in very tight places. No storage bag (there is a storage pocket on the back of the seat though). 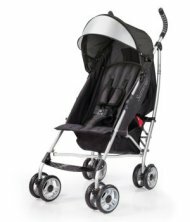 If weight is the most important characteristic of a successful umbrella stroller for you take a closer look at UPPAbaby G-Lite. It’s only 10 lbs (with the storage basket and cup holder). In terms of comfort it offers the bare minimum (adjustable harness straps, padded seat) but at the same time it’s quite functional. There is a cup holder and quite generous basket underneath the seat. G-Lite does not have a reclining seat which may be problematic if you plan to use it with younger baby that needs to nap frequently. What to look for in a stroller for travel? If you are looking for a stroller suitable for shopping mall trips, excursions to local park or longer holiday the primary consideration should be its weight and ease of use. Worth considering are also some options that provide extra comfort for the little passenger. This is particularly important for younger babies who often nap in a stroller. 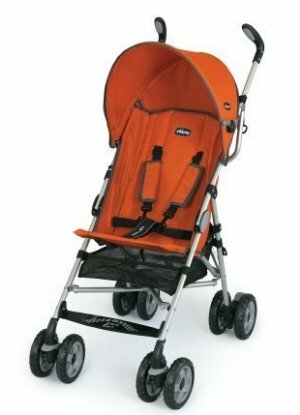 Below is a list of most important features when choosing a stroller. Storage capacity. Once on the road you will likely have at least a diaper bag with some essentials for the baby. Some umbrella strollers come equipped in a sizable storage baskets that most parents find being a bless on the airport or during a short stroll around the downtown. Ease of fold and self standing. As in the stroller for travelling the first is self explanatory the latter is often overlooked. However self standing is nothing unusual among umbrella strollers and having that option can prevent getting the device (and ultimately your babies hands) dirty. Dimensions when folded. A good stroller for travelling families should take as little space as possible. In fairness most umbrella strollers are quite good with this. There are however exceptionally small devices such as Mountain Buggy Nano. It’s so tiny that can be placed in an overhead compartment of most airplanes. Weight and portability. There is a simple rule for umbrella strollers for travelers: the lighter and more portable the better. They all are quite lightweight and few pounds difference is not something you would notice while strolling around a shopping mall. Those few pound however make huge difference when you have to carry the stroller in your hand throughout a large train station. In summary the best umbrella strollers for travel are those which have extensive storage capacity, lightweight, easy to fold and compact when folded.